Since Corelle is famous for producing dinnerware and bakeware that cannot be broken or chipped, it’s hard to resist holding a plate without wanting to drop it on the tile floor to see what happens. 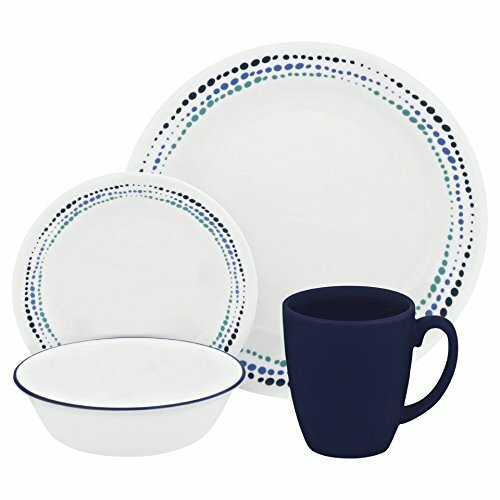 While Corelle doesn’t recommend home tests, this casual 16-piece dinnerware set is still fairly indestructible and is a real asset for busy families. Corelle Livingware is easy to maintain as it’s dishwasher-, microwave- and oven-safe and is never off-limits for small children to use and handle because of its light weight and durability. The set is comprised of four 10-1/4-inch dinner plates, four 6-3/4-inch bread-and-butter plates, four 18-ounce bowls, and four 11-ounce stoneware mugs. Corelle offers a 3-year limited warranty.